Social media coupon sites such as Groupon and Living Social entice consumers to buy online coupons for products, services and procedures offered by a provider at a reduced price with the addition of a viral component in terms of likes and comments that appear on users facebook timelines. A recent search on Groupon unearthed coupons that offer $4,200 worth of liposuction for $999 in Southern California; $3,500 worth of liposuction for $999 in Florida; $2,500 worth of liposuction for $999 in Michigan; and 20 units of Botox® for $250 in Ohio. In California (and several other states), laws prevent payments to physicians based on patient volume. Violating these laws can be punishable by prison and/or $50,000 in fines. In neighboring Oregon, the state’s Board of Chiropractic Examiners and Board of Dentistry have prohibited their respective members from offering these types of discounts. Since most businesses using social media coupons realize the customer is only there for the bargain and will likely go away when the bargain is gone they try to sell them additional services not included in the coupon. They know they will not make any profit off the delivered service and there is a good chance it will not result in new referred business. Aside from upselling the only other option is delivering less than the actual service such as over diluting botox prior to administering it. 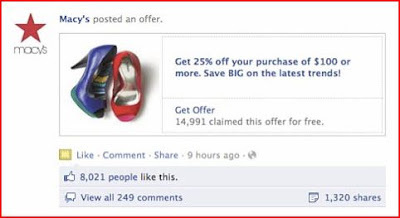 Facebook has joined this online coupon craze with Facebook Offers. The whole idea of social media discount coupons may be a bad business model as evidenced by the drop in share price of Groupon stock from $26 per share around the time of its IPO in 2011 to its current share price of $7.21 per share as well as publicized infighting between the founding partners over company direction. Facebook as well as dropped from over $40 per share near its IPO earlier this year down to $27.15. The Medical Board of California filed a 94 page complaint against Dr. Efrain Gonzalez who is a non-plastic surgeon performing plastic surgery on unsuspecting patients in northern California. He lost his license in Puerto Rico in 2006 for practicing plastic surgery without being a plastic surgeon. The charges include gross negligence, incompetence and aiding or abetting the unlicensed practice of medicine in 15 patients. The injuries include damaging nerves to the hand paralyzing it during breast augmentation, leaving large uncloseable scalp wounds during hair grafting, mutilating the abdomen during abdominoplasty etc. Many of these patients when interviewed say they went to him for his low prices and Groupon deals. Now they are suffering the consequences.